I received a complimentary copy of “The Little Paris Bookshop” direct from the publisher Crown Publishers, in exchange for an honest review. I did not receive compensation for my opinions or thoughts shared herein. Although I have taken a bit of a reprieve from seeking out French Literature from writers who are French bourne or simply stories that arise out of being set in France – I must confess, I still have a healthy interest in reading any story that would warm a Francophile’s heart. I simply think I overdid it initially – you can overtake your sensibility at times, wherein you devour such a large portion of something you love that a short hiatus away from it is better than becoming burnt out completely. In regards to the topic at hand, I believe I kept picking such hard hitting stories of the French, my mind and heart could not re-sync to yearn for more at that particular point in time. When I first learnt of the story inside The Little Paris Bookshop my heart swelled with interest, as any booklover would whose also a bonefide postal correspondent – such as I. The mere idea of how letters are intersecting with personal lives and how stories are capturing the hearts of unexpected readers through circumstances that are quite kismet as they are karmic and serendipitously lovely. What is not to love at the onset of digging inside a novel like this one? I felt for the first time in a long while, I might have stumbled across a novel that would be enchanting rather than mind numbing and uplifting rather than angst ridden to the extreme. Personally I think I should limit how many war dramas I consume per annum. It has a way of getting to a girl! And, why pray tell I have the tendency to read such emotionally draining works of French Lit is beyond me – I need to sprinkle in some contemporaries and some light-hearted historicals; or simply expire my ticket for war dramas for a fraction of time before resuming where I left off. Notation on Cover Art: Do you see that little postal stamp in the upper right corner of the postcard? Notice how half cover is overtaken by said postcard? Do you have know wicked happy it is to receive a letter by postal mail? There is such a ferret of joy erupting out of seeing a postmark, a stamp and an envelope addressed to you arriving by Post. A well of happiness about to enter your life via the written or typed conversation eagerly greeting your fingers as you slice open the envelope to reveal it’s contents. So too, is the same thirst for excitement I found in spying this book cover as a precursor to what I might find inside it’s novel’s heart. The backdrop of Paris was quite a smashing find as well. NINA GEORGE works as a journalist, writer, and storytelling teacher. She is the award winning author of 26 books, and also writes feature articles, short stories, and columns. 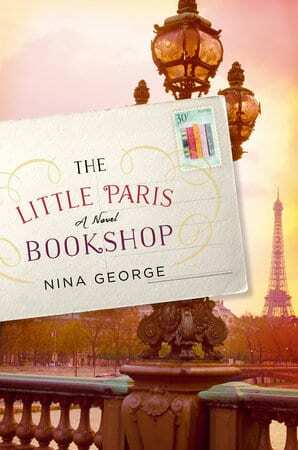 The Little Paris Bookshop spent over a year on bestseller lists in Germany, and was a bestseller in Italy, Poland, and the Netherlands. George is married to the writer Jens J. Kramer and lives in Hamburg and in Brittany, France.